It is mainly through the many retellings of the story of the Three Pleasures of Rong Qiqi that he became an exemplar for living naturally and spontaneously. He thus seems to have been a role model centuries later for the Seven Sages of the Bamboo Grove. Illustrations often showed him together with them. Qin illustration 13 in Taiyin Daquanji says it is Rong Qiqi's Double Moon (雙月 Shuangye) qin. When Confucius was traveling around Mount Tai he saw Qiqi (walking in the wilds of Cheng and) wearing a rough fur coat, playing the qin and singing. Confucius sat down and asked him, "Why are you so happy?" (Qiqi) answered, "There are many reasons why I am happy. People are the most valuable things, and I am a person. Men are ranked above women and I am a man. Most people don't get out of infancy before they die, but I am 90. Most people are poor and death is always at the end. If I dwell in the norm and reach the end, why add melancholy on top of this?" Confucius said, "Wow! How carefree." (Confucius) listened further to (Rong Qiqi's) qin and discussed happiness with him for three days. The emotions of his harmonizing sounds were like this. The common feelings of everyone take what they have within for unhappiness and outside for happiness, so if they are poor they think about wealth, if not respected they think of respect, while alive they fear death. And so in their nature they long for the appearance of wealth, and in their environment they desire fame and profit, with the ones unable to turn themselves around all like this. Happy people such as Qiqi, they are unable not to be happy. And so Daoists happily consider Qiqi such a person, and this should be sufficient to admonish people who are always covetous. The translation is tentative in a number of places. 列子天瑞 Liezi, Heaven's Gifts; a shorter version of the story here. 十二國史 Shi'er Guo Shi, quoted in 琴書大全 Qinshu Daquan, Folio 16, #9. Audrey Spiro, Contemplating the Ancients. Numerous entries. 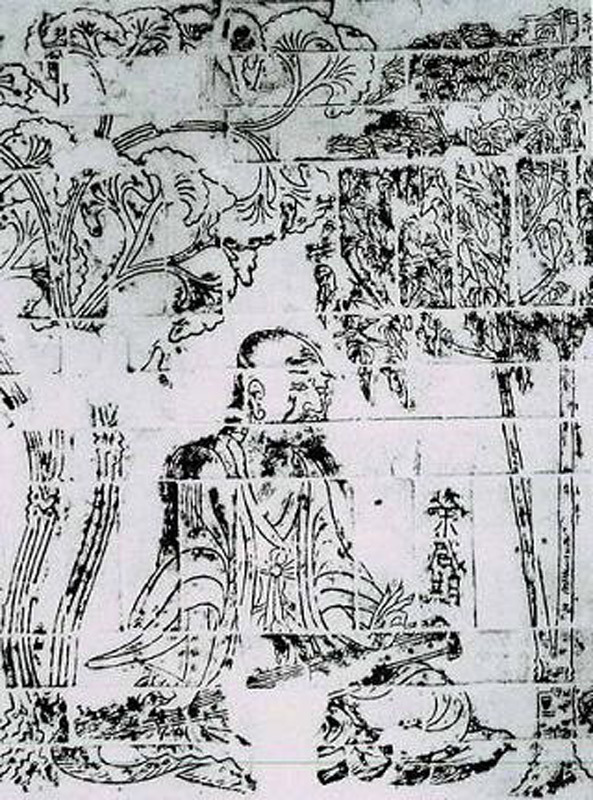 The brick relief image at right is a detail from the brick relief images of Seven Sages of the Bamboo Grove at a Nanjing tomb. These images also show Xi Kang playing the qin backwards; however, in this same series Ruan Xian is playing his ruan lute correctly. 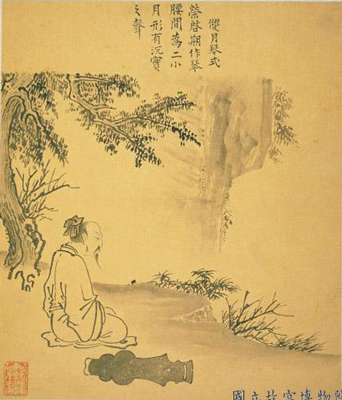 As for the image above, Rong Qiqi with his double moon qin, it comes from a collection of images called 宋人畫歷代琴式圖. The title there is "雙月琴式 The style of a double moon qin". The inscription then says, "榮啟期作琴腰間為二小月形。有深實之聲。 Rong Qiqi made a qin that had at its waist the shape of two small moons. It had a true sound that was deep and solid." There is also an image of a Rong Qiqi's double moon qin amongst these qin styles, with the same commentary, but instead of having two round areas near the bottom of the qin it has one there and an opposite indentation near the top. 有親可畏 Having parents one can hold in awe. 天生萬物，唯人為貴。而吾得為人，people are the most valuable things, and I am a person. 男女之別，男尊女卑，故以男為貴；吾既得為男矣 Men are ranked above women and I am a man. 人生有不見日月、不免襁褓者，吾既已行年九十矣 Most people don't survive infancy but I am 90. The most famous of these would of course be the first set, attributed to Mencius. However, amongst early qin players the last set might have been the most popular. Many sources mention a melody called Three Pleasures (see footnote below), but there is no such title in the surviving repertoire. The titles San Le Tu (Schemata for Three Pleasures) and San Le Pu (Tablature for Three Pleasures) seem to refer to the same story. The title seems to have been quite common, but there is no information on how many versions might have existed in the past, and it is not on Zha Guide's active list. An entry in Qinshu Daquan Section 11 ascribes the melody to Rong Qiqi and gives a similar account to here, while its Section 13 (#14) lists San Le amongst shang mode melodies. Qinshu Cunmu #2 三樂圖 San Le Tu traces the many occurences of the title. There is also mention of a Three Pleasures Song (三樂歌 San Le Ge) in a poem by Yelü Chucai. The original text is as follows. The passage from Liezi is not cited, and a few words are change.